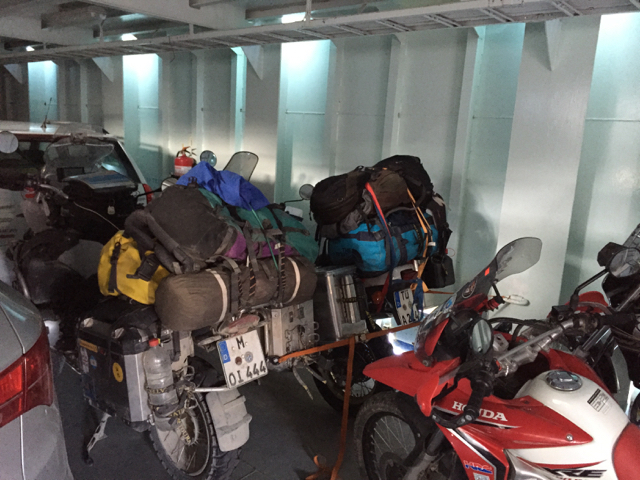 After 15 minutes we are on the ferry and parked the bikes on the main stand – very unusual. At 11.30 we put our feet onto Tierra del Fuego! At the begin we drive along the coast and plenty of paddles show how much it has rained within the last days. Our first stop is at the Bahía Inútil visiting a colony of king penguins. Unfortunately we are not able to get closer than ~15 meters to them. For an entrance fee of $12.000 (€ 16,50) this is finally not a lot to see. But it is used for development… I’m happy that the sea wasn’t that rough during our strait crossing. Heading to San Sebastian the wind becomes much stronger. 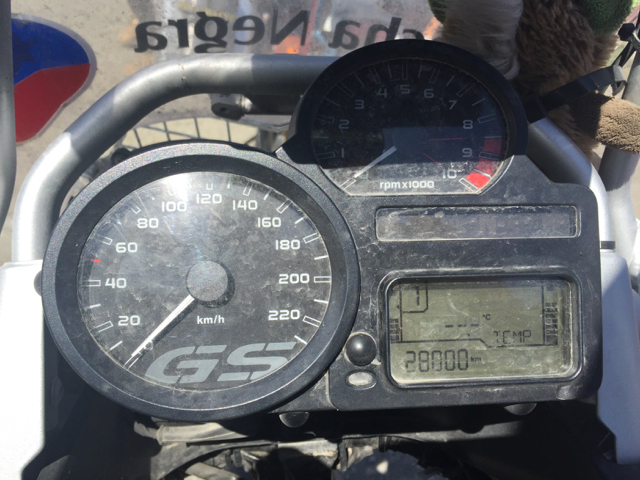 The first time that I really have to fight with it 🙂 With exactly 28.000km in my tachometer I crossed the Chilean border. On the Argentinian side the road is paved again – and boring. But we find a great garage called Albatros Servicio, Cristóbal Colón 1174, Río Grande, Tierra del Fuego. Facu und Alejandro are so helpful and dismantle immediately my air filter. Surprisingly it was almost clean even though I drove most of the kilometers on dirty roads. So, no need to replace it. After 20 minutes Facu was ready with Flecha and when I asked him what it costs: nothing! I gave him a tip and he said when I’m returning we will have lunch together. The road to Ushuaia is really nice. Lakes, forests and later curves makes the trip really diversified. And after almost 7.000 driven kilometers from my starting point I arrived in Ushuaia. And Queen Mary 2 is here, too. Ushuaia has a nice downtown center and I spend the afternoon with a visit of the old prison which is as well a maritime museum and really recommendable. The next day it is raining heavily and after while the weather seems to get better and I go to the very end of Ruta Nacional 3 in the national park Tierra del Fuego. In the afternoon the sun comes out and brings the nature into a great light. Since I have see most of the region and the boat trips are going to show just more penguins and sea lions I decide to leave the city one day earlier and got actually my money back for the night that I paid already. Usually I would never have the idea to ask, but… Now I’m heading back to North direction. I stay one night again in Rio Grande and have lunch with the mechanics. es ist immer schön mal wieder nach zu schauen wo du dich rumtreibst und die Bilder sind natürlich immer super schön. Bin heute Nachmittag von einer Woche Kurs zurückgekommen, was sehr spannend war….lasse es dir gut gehen und geniese deine freie, wilde Zeit.